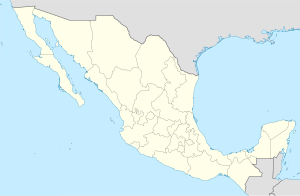 Huehuetoca is a municipio (municipality) in the States o Mexico, central Mexico, an the name o its lairgest locality an municipal seat an aw. The toun oreeginatit wi the migration o a Chichimeca group led bi Mixcóatl intae the aurie aroond 528 CE. The dounset wis conquered bi a nummer o fowk. The oreeginal Huehuetocan veelage wis destroyed bi the Otomi frae Xaltocan. Thir Otomi wur then vanquished bi the Huexotzincas, the Tlaxcaltecas, the Totomihuacas frae Cholollan an the Cuauhtinchantlaca frae Tepeyac. Wi each wave o conquest, the veelage became pairt o a lairger poleetical seestem. The last native fowk tae control the veelage wur the Tecpanecas. Efter the Conquest o Mexico bi the Spainyie, Huehuetoca, alang wi Cuautitlán, Zumpango an Xaltocán wur gien tae the conquistador Alonso de Avila as an encomienda, or as a sort o feudal territory. The aurie wis evangelisit bi the Franciscans based in Cuautitlán, an it is thocht that the first kirk wis foondit bi Friar Pedro de Gante. Bi the mid 1500s, Huehuetoca an thirteen ither nearbi veelages wur managit bi a secular authority, against the wishes o the local Indies. At the beginnin o the 16t century, Huehuetoca wis chosen as the steid o ane o the first drainage projects for the Glen o Mexico. Beginnin in 1607, ingineer Enrico Martínez, persuadit the Spainyie vice-regal authorities o the need tae big a canal tae drain an divert the watters o the Glen. The project initially attractit the attention o notable ingineers, airtists an poleetical figurs includin the viceroy, Luis de Velasco II, hissel. The complete project teuk aroond 200 years tae complete. In 1816, durin the Mexican War o Unthirldom, resident Pedro Saldirna wis accuised o heidin a rebel group bi the local priest. Housomeivver, Saldirna wis no prosecutit. Haciendas near the toun wur sackit durin the Mexican Revolution biy Zapatistas. The Cuautitlán River crosses juist north o the toun an flows intae the canal biggit for drainage o the Glen o Mexico. This river/canal is cried the Nochistongo an aw, namit efter an auld veelage that wis locatit in wha is nou the State o Hidalgo. The toun wis a stap on the Mexico Ceety - Nuevo Laredo rail line that wis inauguratit in 1888 bi the Naitional Mexican Construction Company (Compañía Constructora Nacional Mexicana) an later run bi the Mexican Naitional Railroad Company (Compañía del Camino de Fierro Nacional Mexicana) an aw. This rail line wis widened here atween 1901 an 1903 tae serve as a link north for Toluca an ither central-Mexico localities. The toun contains a nummer o historical steids includin the Parish o San Pablo, datin frae the 16t an 17t centuries, The Viceroy Luis de Velasco Hoose, kent as the Hoose o the Viceroys an aw, frae the 18t century. This hoose servit as a residence for the viceroys whan thay came tae veesit an monitor the Nochistongo drainage project. Ither steids include the Chapel o El Calvario, frae the 19t an 20t centuries, the Brig o El Calvario, frae the 19t century, the Brig o los Arcos del Acueducto, frae the 19t century an Temple o San Miguel Jagüeyes, frae the 18t century. The municipality borders the municipalities o Tepotzotlán, Zumpango, Tequixquiac an Coyotepec o the State o Mexico. The State o Hidalgo borders tae the northwast. It occupees a territory o 161.98km2. The territory contains a nummer o erodin volcanic cones, maist o which belang tae the Sierra de Guadalupe an the Sierra de Tepotzotlán. Significant elevations include Munt Cincoque, kent as Munt Huautecomaque (2,630 metres) an aw, the Cerro Grande Guaytepeque, kent as Cerro de la Estrella (2,700 metres) an aw, the Cerro de Ahumada, kent as the Mesa Grande an aw, (2,580 metres) an the Cerro de Guaytepeque (2,250 metres). The aurie’s main river is the Cuautitlán River. Acause o the drainage project o the 17t century, this river nou leads tae the Tula River in Hidalgo, insteid o the Glen o Mexico. The municipality contains twa lairge dams tae store wátter for agricultural uise, 16 streams, maist o which contain watter anerlie in the rainy saison, an 15 ponds or sma lakes. The twa lairgest are cried the San Miguel de los Jagüeyes an the Jagüey Prieto. The aurie haes a rainy saison durin the months o Juin tae October an a dry saison frae November tae Mey. Durin the year, temperaturas range frae 6.9 °C in the Winter an 23.8 °C in the Simmer, wi an average o 15.4 °C. The municipality is primarily agricultural, wi fields dedicatit tae corn, alfalfa an vegetables. Sheep an goats are raised here an aw, wi zebu bein recently introducit. The municipality is growin rapidly, maistly acause it is locatit in the Greater Mexico Ceety aurie. The operators o the Tren Suburbano, the commuter rail that connects the northren suburbs wi Mexico Ceety haes expressed interest in biggin a branch that will lead tae Huehuetoca. In late 2008, the hoosin developer ARA, annooncit plans tae big 26,000 hames in the municipality ower the next several years. ↑ "Autorizan a ARA para construir megadesarrollo en Huehuetoca, Edomex". El Universal. 10 November 2008. Retrieved 17 December 2008. This page wis last eeditit on 23 Julie 2018, at 21:44.